Today I have come up with another Nethili Recipe prepared as an authentic Tamil Cuisine the "Thokku". 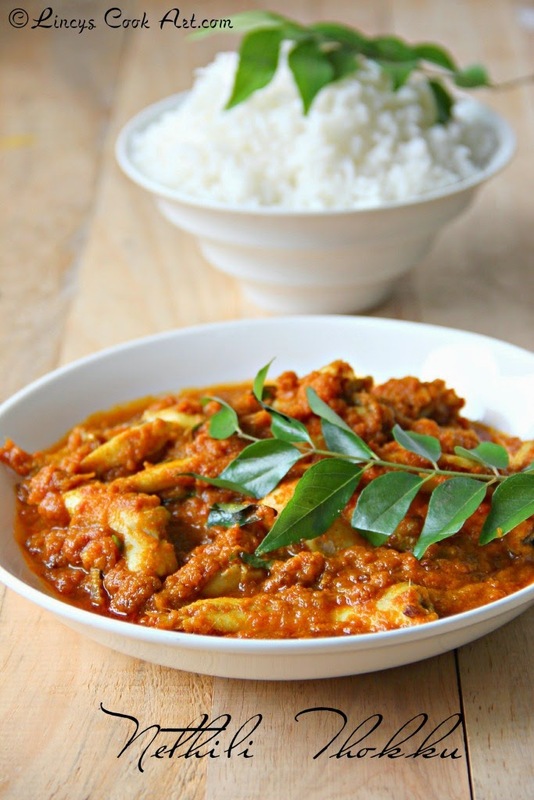 Thokku is nothing but a thick gravy form of the curry almost with pickle consistency. Here i have prepared this dish using less oil. You could add extra oil if you want to. But this tastes really nice with less oil too. So it does not require adding extra oil and increasing the fat content in the gravy. This dish tastes really nice and does not require any curry to serve with this. Simply delicious with plain rice. If you want you can serve it with rasam. We loved this preparation. Its spicy and also really a mouthwatering recipe; feels like one wants to eat more and more. Grind onion, garlic and tomato as a fine paste in a blender. Extract tamarind water from soaked tamarind. Heat 3 teaspoons of oil in a pan; add fenugreek seeds, jeera and curry leaves. Once it is browned, add the ground onion tomato paste. Cook the paste in oil well till the oil separates on top. Now add the turmeric powder, chilli powder, coriander powder and pepper powder. Add half a cup of water if your feel the gravy is too dry/thick. Mix well and cook for thirty seconds; add tamarind water and salt; cook for a minute till the raw smell of tamarind leaves. Add the fish and salt; Cook two to three minutes without mixing using a ladle just swirl the pan for mixing. Swirl the pan; slightly shake and keep each thirty seconds to coat the masala over the fish. Add a teaspoon of oil over the gravy and allow to thicken the gravy like thokku consistency. Add curry leaves and switch of the gas; just once again swirl the pan to mix well. Looks fantastic Linzy.& good pic. Tempting nethili thokku...drooling here dear :) Awesome clicks too !! Delicious nethili thokku Love the white rice on the background. Looks yumm. Another must try, again only for next week before need to buy the fish. Perfect with those spiciness we love. Am ready to finish that whole platter rite now, Nethili thokku is just inviting me.